There is a saying "The culture of a city can be revealed by its food". In this tropical city, seafood should not be your only choice. To get close to the local culture, tourists should have a try of those local specialties. 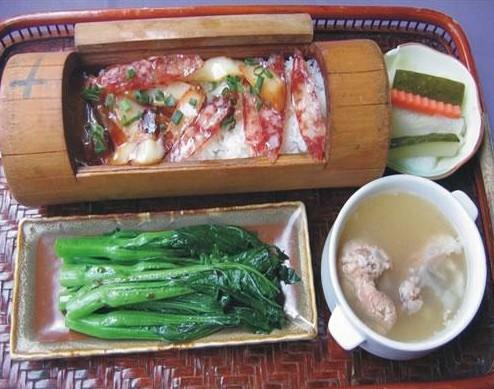 Huangliu Duck, which is poached and served cold, can be found in many Hainan specialty restaurants. The duck smells great because of the added special ingredients. You can find many restaurants of this kind in Shengli Road (胜利路), Jixiang Road (吉祥路), and Xinfeng Road (新凤路). This is a very famous dish in Sanya. You may have heard a lot about Hainan Wen Chang Chicken (海南文昌鸡). However, you do not have only one choice for A Er Ba Bao Chicken is one that rivals it or even is more delicious than it. Have a try and you won’t be disappointed. The crab lives between stones and feed on Ganoderma plants. Cooked Ganoderma Crab is very tasty and has an opulent mouth feel. This one is a fresh new dish evolved from Ming Shrimp (明虾). Cut the heads and tails of the shrimps and then cook them separately into two dishes. After that, make some shrimp meat balls. 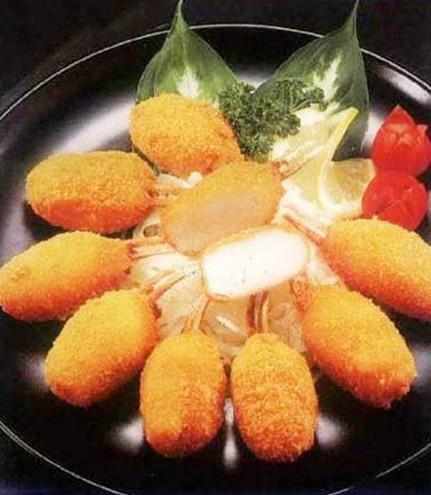 Lay these shrimps of different flavors in a plate and place them as to shape them like a lantern. In Hainan, rice noodles are usually cooked with meat and organs. Differently, Gangmen Rice Noodles are cooked with seafood. You may have heard a lot of bamboo rice before. However, the bamboo rice here is extraordinary for it chooses the famous Shanlan Rice (山兰稻) as its main ingredient. As one of the famous traditional dish in Hainan, Hele Crab is well known for its unbreakable shell and rich crab paste. 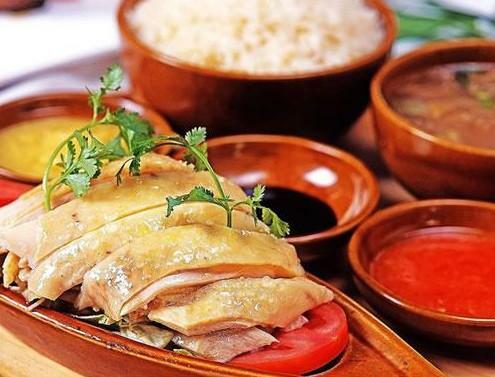 You may have heard a lot about Hainanese Chicken Rice and you may have tried it in Singapore. However, you should have a try of it in Hainan in order to make your trip unforgettable. It’s a traditional snack and you can find this dish almost in every restaurant in Hainan. The cooking method is so simple that you can make it yourself. Choose a fresh coconut and cut it into parts which will shape like a boat then put sticky rice on the "boats’ and cook. The cooked rice is semi-transparent which looks like pearls, so it’s also called Pearl Coconut Boat. This dish is only beautiful but not very tasty, though. Paederia is a kind of plant that is usually used as herbal medicine, which can clear away fever and nourish the stomach. First triturate the paederia and add powder and water. Then mix them up and cook. After that, add some coconut shred and other seasonings and cook for another 5 minutes. Then you got the paederia cake. 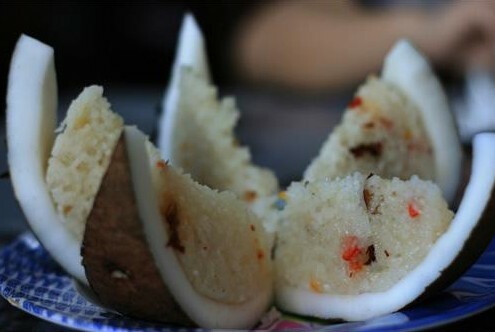 It’s very popular in Hainan which is a must served snack in lunar July 1st. This is a romantic Coffee Shop with beautiful sea view. The calf’s leg and calf’s rib here are strongly recommended. There are several Islam restaurants in Sanya and the Xinjiangren Restaurant (新疆人餐厅) is the most famous. As this is an aged road for all kinds of snacks, you can find what you want here, from the traditional Hainan snacks to special snacks from other places.